SuperKids Nutrition caught up with culinary expert and physical fitness guru, Dana Angelo White, MS, RD, ATC and asked her about how she gets kids in the kitchen and excited about seasonal foods. As a culinary expert, what are 3 ways you get children excited about cooking? Quality time. Let the kids spend time with you in the kitchen – even babies can enjoy watching you cook. Here’s a super fun cooking guide for kids ages 2 to 12! Let everybody get their hands dirty. Delegate cooking tasks to each child, whether it be washing lettuce, setting the table, or chopping vegetables for the older kids. This allows kids to get involved in the cooking process, understand the hard work it takes to make a good meal and teaches them how to cook. Let your kids have a say. Ask them to choose what type of veggie they want to have with dinner or whether they want to grill or bake the chicken – the more involved they are in the decision process, the more excited they will be to eat the meal. Just make sure that you are setting boundaries to choose between healthy options and not any food they want. For example, “would you like to cook broccoli or spinach for our vegetable tonight?” You can also try giving incentives for healthy choices. What 3 tips can you suggest to parents to help them encourage their children to try new foods? The most important thing parents can do is not give up! It can take numerous introductions until a child accepts a new food. Don’t force your child or fight over it. Try these 7 food rules to help create a balanced approach to healthy eating. Allow kids to “get to know” the new food. Tell them what the food is, how it was prepared, how it was grown and what it does in the body. Explain how important the new food is for being healthy and growing strong, it will build interest. Lead by example. If mom and dad are pushing vegetables off to the side of the plate (or not putting them on the plate at all), the kids are going to do the same. How do you come up with kid-friendly meal ideas? Is there a how-to-strategy you can offer to parents? I try to make simple and easy recipes that everyone will enjoy. It’s not practical to be a short-order cook, making something different for everyone in the house. All the recipes on my website DanaWhiteNutrition.com are quick, healthy and easy to modify so that everyone at the table is happy. During the week, I often make healthy pizzas, soups, sandwiches, and tacos – things that can be easily modified to please everyone. Mom and dad can pile on some of their favorite toppings and so can the kids. In your experience, what are the most frequent barriers that prevent families from preparing nutritious meals? Can you share with us 5 ways to overcome these barriers? Lack of time, money and the misconception that cooking healthy is just “too hard” are the complaints I hear most often. But there are plenty of ways to make healthy, affordable and delicious meals every night of the week. Use your plan to create a shopping list to buy everything you need. A little organization goes a long way! Buy extra of the foods you use often when they are on sale. I always stock up on staples like pasta, brown rice, boneless chicken breast, flank steak, frozen shrimp and ground turkey breast when they go on sale. You can make a million recipes from these simple ingredients. Use your freezer. It is just as easy to make a double batch of a recipe as it is to make a single one. I always make extra burgers, soup, chili, and baked pasta dishes. My recipe for quesadilla lasagna freezes beautifully and on nights when I’m pressed for time, I grab it from the freezer and dinner is ready in minutes. Buy produce when it is in season. I live in Connecticut and from May to December almost all of our produce comes from a local farm, which makes it much more affordable. Some of the same savings can be found at the grocery store. When seasonal produce is more available, the price tends to be lower. According to the BBC, The UK has made it a goal to require cooking classes in all middle schools as a strategy to prevent childhood obesity. How do you feel about this public health intervention on childhood obesity? I think it’s a wonderful idea and I’m jealous we don’t have something like it in more of our schools. It will be challenging to execute, but anything that gets kids in the kitchen and shows them that cooking can be easy and fun is fine by me. You write often about including seasonal produce into family meal planning, why is this beneficial to parents and kids? Eating with the seasons benefits our health and the health of the environment. Seasonal foods are at the peak of freshness and nutrition. Since available produce changes with the seasons, it’s a built-in way to include variety in your diet. Variety is important to make sure you are giving your body all the nutrients it needs. It is also a great way to get in touch with your area. We like to visit our local farm and talk to our farmer about what foods are in season. We look forward to what the different months have to offer, like strawberries in late June, zucchini in July, and butternut squash in late September. I write a series for my blog called Market Watch where I share some of my favorite farmers market finds. I encourage people to explore their local farms and markets. That’s how we eat at my house and I suggest the same to my clients. Here’s a recent Market Watch post for Rainbow Chard. What observations, if any, have you noticed in restaurant menus since the new menu label law has passed? Do you feel the new law will have an impact on children’s menu planning? What are the 3 most important nutrition facts parents should look for when choosing a meal for their child? I hope that more restaurants post nutrition information (not just the ones that are required to do so). It can help parents can make informed decisions. I don’t think that the lowest calorie option on the menu is always the best choice, but sometimes those numbers can be really eye-opening. Parents should also pay attention to things like added sugars and the quality of the ingredients. The smartest thing parents can do become educated in how to read a food label – it’s tricky! I think most people just peak at the numbers. The most useful information is in the ingredient list. Here are helpful tips on dining out healthy for the whole family. First, congratulations on becoming a mother! Has becoming a mother changed your eating habits and views on the health of our nation’s children (if so, please explain)? I’m so lucky that my husband and I love to cook and eat healthy food. Now that I’m a mother, my goal is to keep doing what I have always done – make healthy and delicious food from whole ingredients. I hope to lead by example and that my children grow up to love food as much as my husband and I do. 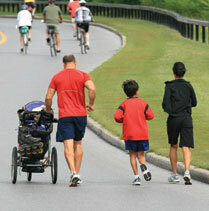 As a Certified Athletic Trainer, would you share with us how you make physical activity a fun family event? Do something active every day as a family. Head out to the beach to collect shells, walk the dog, visit the local playground or even just take a long walk around the neighborhood. When the weather is bad, have a family dance party in the living room – it all counts as exercise and it’s a great way for everyone in the family to bond. It teaches children that exercise is important and that mom and dad take the time to stay in shape as well. When my daughter is playing on her play mat, I sneak in a few sets of push-ups and sit-ups. She loves to watch her mommy bounce up and down and I get a little resistance training in at the same time. Actively play every day! As a nutrition expert for the Food Network.com, have you seen a growing public interest in the culinary world, nutrition, and cooking shows? Healthy cooking is so much more than counting calories. It’s about whole foods and simple preparation methods coming together to create something truly delicious. There is definitely a growing interest and demand for nutritious recipes that are tasty and easy to get on the table. More and more people are finding their way back into the kitchen to eat more healthfully and to save money. Cooking shows teach people about food and how to prepare it. We created the Healthy Eats blog so that we could shine a light on the numerous healthy recipes from all the shows on Food Network as well as the ones created by our staff dietitians. Learn how to make cooking with the kids a family event with our Healthy Kids Today, Prevent Cancer Tomorrow recipes, activities and tips! Dana Angelo White, MS, RD, ATC received her Master of Nutrition and Education at Columbia University where she also completed her dietetic internship. She is currently the President of Dana White Nutrition Inc., which provides nutrition and fitness consulting. In addition, Dana works as an adjunct professor for Quinnipiac University. She writes a thriving blog for the Food Network titled “Healthy Eats,” where she talks about seasonal and healthy recipe ideas. She also holds accreditation as a Certified Athletic Trainer. Her past careers include work as the head athletic trainer at Marymount School, Nutrition and Fitness manager at DietTV.com, Inc., Summer programs Health Director/ Camp director at Cheshire Academy, Intern Athletic Trainer at Yale University, and Programs staff athletic trainer at New England Seawolves. She specializes in the culinary arts and sports nutrition.